Particle stratification in gravity concentrators is influenced by both particle size and particle density. King’s stratification model defines very well the segregation of particles in bed forming separators but is based on mono-sized feed particles that are distributed in density. 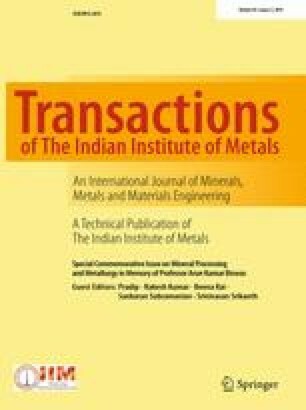 The model has been extended to incorporate particle size effects into it and to define segregation patterns of the bed (Venkoba Rao in Int J Miner Process 85:50, 2007). The extended stratification model shows that the segregation patterns evaluated from it at various cut heights conform to size-density partition surfaces. The model is more theoretical when proposed and lack experimental evidence. In Part A of this series of papers, the model is validated with segregation patterns measured from a batch jig operation by introducing small amount of tracer particles (of various sizes and densities) along with feed particles of fluorite ore. Such patterns formed by tracers are measured by slicing the segregated bed at various cut heights. The patterns of partition surfaces by tracers are in support of the extended stratification model. This exercise also shows that small amount of size-density tracers along with feed particles can quickly help to characterize the segregation patterns of a jig bed. Also, by inferring segregation patterns from Part B of this paper series, a single go approach is proposed to correct the errors of partition surfaces of the entire bed, arising from sparse measured tracer data at various bed heights. BVR acknowledges Mr. Ramesh Mahadevan, Regional Managing Director, Tenova Delkor, Bangalore and Dr. Pradip, TRDDC, Pune for their individual encouragement in this work.